When building a custom home, the small details set the home apart from the ordinary tract home. Details such as copper vents can provide natural, long lasting beauty. These details allow the home to function normally with a unique feel and look. Vents are used in many places in the home. They range from the chimney cap that prevents rain from entering the fireplace to the dryer vent that allows your clothing to dry. In most homes, these vents are made of plastic, aluminum or galvanized metal. Some vents are powder coated to make a better fit for the home’s color scheme. However, copper vents are supplied in their natural color. With the passing of time, these vents begin to develop a natural green patina that looks great with many different construction choices. Copper vents offer many advantages to the homeowner. While they will change color over time, they do not rust or chip. While copper is a soft and malleable metal, it is stronger than aluminum or plastic. It can withstand the extreme heat of the rooftop without yellowing or breaking like plastic. This means the vents are less likely to form leaks through cracks or tears. Since the product does not corrode, it is not going to break away in a windstorm because the materials have been compromised by the elements. Consider some of the places where you can make use of vents made of copper. 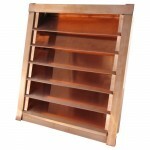 A copper wall vent may be used for the exhaust fan from the kitchen or bath. The copper color looks great against natural wood finish and changes color over time, just as the surrounding wood will do. The same holds true for a copper dryer vent that allows moisture to be vented outside the home. The copper chimney cap is provides a natural choice to match brick of almost any color. As the shiny bright color ages to a natural blue green it continues to accentuate the chimney. Roof air vents can allow the stale hot air to escape from the attic of the home while the copper air intake vent furnishes cooler inside air to reduce cooling costs. No matter what copper vents a homeowner selects to install in the home, he can rest assured that these products offer a long life. In addition, copper adds natural beauty that will last the lifetime of the home. FAMCO provides vents for use in homes as well as businesses.